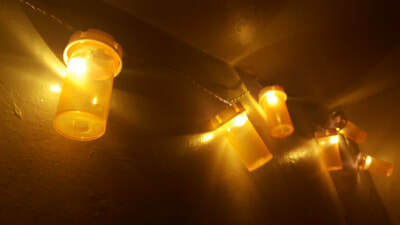 ​As a person with slight hoarding tendencies, which pairs nicely with the desire to be creative, I pondered what to do with the ridiculous amount of prescription pill bottles I had amassed over the years. 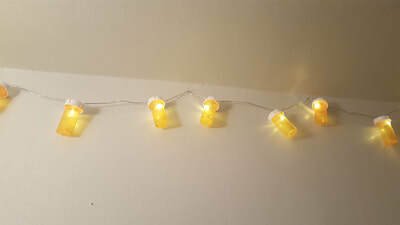 Falling down the rabbit hole that is Pinterest, I finally came across something I really liked: Pill Bottle Christmas Lights. Unfortunately, I couldn't find step-by-step instructions so, in true DIY fashion, I figured it out my own damn self. First, get some string lights. 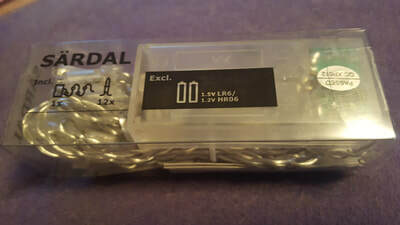 I found these battery-operated LEDs at IKEA on the cheap. A string of 12 cost about $2. LEDs will be safer than non-LED lights. You don't want your bottles catching fire! 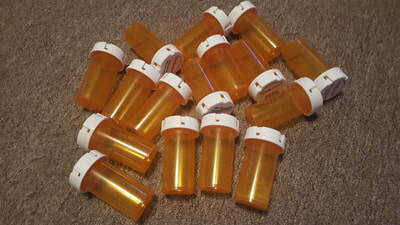 Second, remove the labels from your pill bottles; unless you don't mind everyone knowing what meds you take. Now THAT could be a conversation starter! 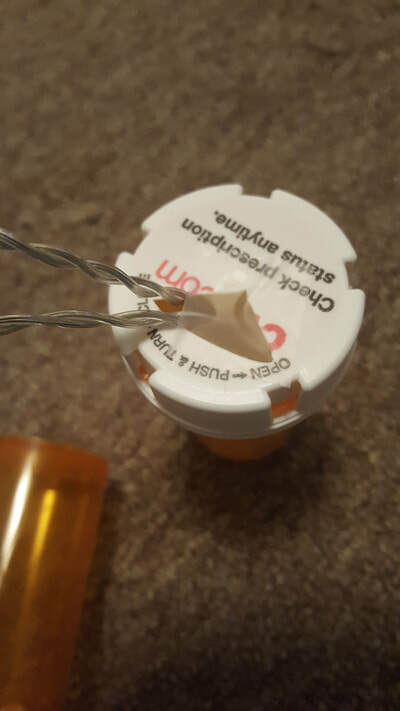 I thought I'd be able to drill through the plastic top, but the drill bit I had didn't work. Undeterred, I took a nail to it and hammered until it broke through. Clearly, it wasn't the nice, clean hole I was expecting. 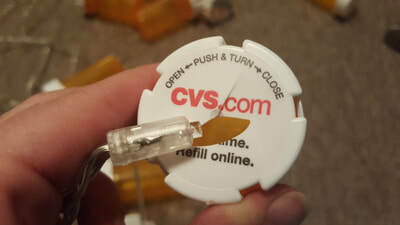 Nonetheless, once I threaded the light through the hole, I taped the top to keep it in place. Easy peasy! The project took about 10-15 minutes. I hammered a few nails into my bathroom wall, strung them up, turned them on, et voila! 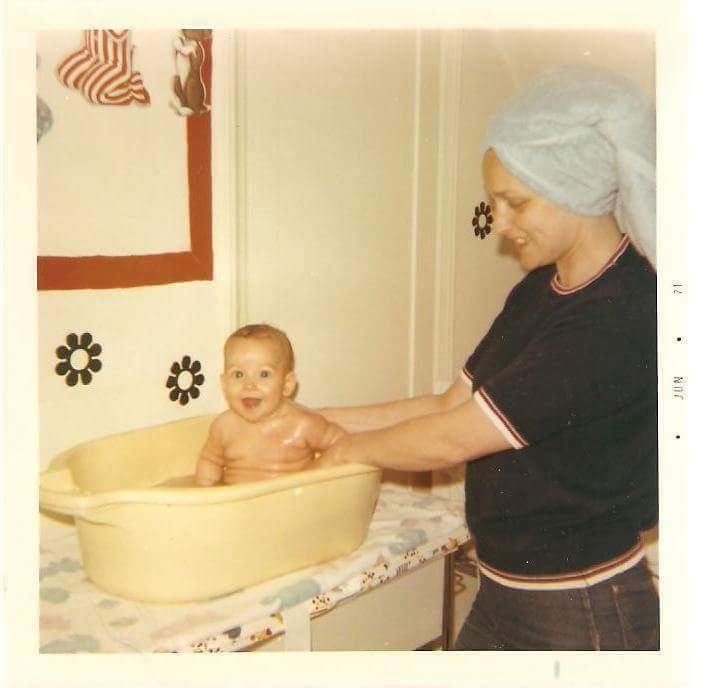 Between these fun, kitschy lights and the picture hanging on the door (of my mom bathing me as a roly-poly baby; my nickname was "the Michelin man"), the loo just may be the coolest room in my apartment! No wonder my cats always insist on following me in there.